After two years of declining sales, India’s largest truck financier Shriram Transport Finance Co. Ltd is starting to see demand for new trucks improve in a few states. “We see demand for new trucks in a couple of states, Gujarat, Maharashtra, Karnataka and Andhra Pradesh, due to state government’s initiatives,” managing director Umesh Revankar said. However, falling freight rates in Rajasthan, Punjab and Delhi due to a decline in farm produce movement has resulted in lower demand for trucks in those regions, he said. A deficient monsoon has hurt demand dramatically for logistics in certain states, said a Mumbai-based analyst who tracks the company but did not want to be named. Shriram Transport largely lends against used commercial vehicles. During the fiscal third-quarter, sales of new trucks fell by 31.5% to Rs.4,785 crore, while used truck sales climbed 14.2% to Rs.51,600 crore. Despite fresh disbursements on new commercial vehicles, the existing repayment portfolio of new vehicles has fallen significantly as customers have paid off their loans, according to the analyst. “We have started providing loans on new trucks in the last four months which we had significantly reduced in the last two years,” said Revankar. Earlier, to discourage customers who couldn’t afford to buy a new vehicle, the company would ask them to put in a larger down payment. Shriram Transport Finance, on a standalone basis, reported a third-quarter net profit of Rs.312.4 crore, versus Rs.301.3 crore year ago. 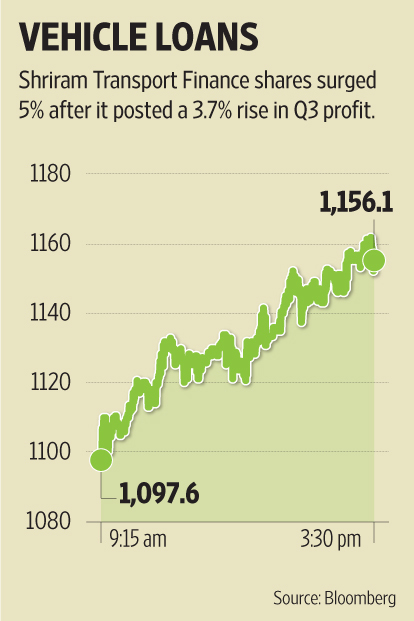 The 3.7% rise in net profit fell short of analysts’ expectations. Analysts polled by Bloomberg had estimated a net profit of Rs.324 crore. 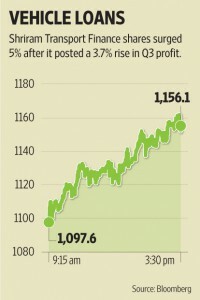 Net interest income for the quarter jumped 12.5 % to Rs.1,052 crore, surpassing the analysts’ estimate of Rs.1036.6 crore. While the quality of its assets is yet to improve, the company is trying to contain and manage bad debts, said Revankar. He said a significant improvement in bad loans can happen only if the economy recovers. Revankar expects a revival in sales of trucks to happen in the back half of 2015-16, but the analyst said a recovery could happen earlier if the government opens coal mines to commercial mining. The company reported gross non-performing assets (NPAs) of 3.59% and net NPAs at 0.74% for the quarter ended 31 December, compared with 3.56% and 0.75% a year ago. On Wednesday, Shriram Transport Finance shares rose 5% to close atRs.1,156.10 on BSE, while the exchange’s benchmark Sensex lost 0.04% to close at 29,559.18 points.